Many women, men and children affected by chronic undernourishment suffer from what the UN Food and Agriculture Organization (FAO) calls ‘extreme hunger’. This means that their daily ratio of calories is well below the minimum necessary for survival. Many people die on a daily basis from starvation. Malnutrition, also called the ‘hidden hunger’, refers to inadequate intake of calories, proteins or nutrients. Thus, malnutrition necessarily encompasses undernourishment; however it stretches beyond the latter since it might be that a person receives enough calories but not enough nutrients. Malnutrition is quieter than famine – in the sense that it does not attract the attention of the media – but it has no less tragic implications for those suffering of this disease. Malnutrition heightens vulnerability to other illnesses and almost always has serious physical and mental effects – the lack of brain cell development, inadequate growth. Serious malnutrition can also be hereditary, as many malnourished mothers give birth to malnourished babies. A vicious circle ensues. The right to food is a human, legal and clearly defined right which gives rise to obligations of states to reduce both chronic undernourishment and malnutrition. The right to food is a human right. It protects the right of all human beings to live in dignity, free from hunger, food insecurity and malnutrition. The right to food is not about charity, but about ensuring that all people have the capacity to feed themselves in dignity. The right to food is protected under international human rights and humanitarian law and the correlative state obligations are well-established under international law. The right to food is recognized in article 25 of the Universal Declaration on Human Rights and article 11 of the International Covenant on Economic, Social and Cultural Rights (ICESCR), as well as a plethora of other instruments. 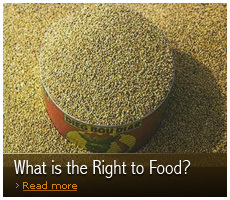 Noteworthy is also the recognition of the right to food in numerous national constitutions. 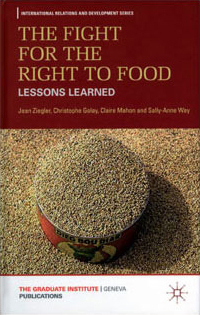 Voluntary Guidelines to support the progressive realization of the right to adequate food in the context of national food security (Right to Food Guidelines), 2004. Voluntary Guidelines on the Responsible Governance of Tenure of Land, Fisheries and Forests in the Context of National Food Security, 2012.
the right to adequate food is realized when every man, woman and child, alone and in community with others, has physical and economic access at all times to adequate food or means for its procurement (para. 6). - Report of the Special Rapporteur on the right to food, Jean Ziegler, A/HRC/7/5, para 17. Following these definitions, all human beings have the right to food that is available in sufficient quantity, nutritionally and culturally adequate and physically and economically accessible. The three main elements of the right to food are: availability, adequacy, and accessibility of food. Availability refers to enough food being produced for both the present and the future generations, therefore entailing the notions of sustainability, or long-term availability, and the protection of the environment. Adequacy refers to the dietary needs of an individual which must be fulfilled not only in terms of quantity but also in terms of nutritious quality of the accessible food. It also includes the importance of taking into account non-nutrient-values attached to food, be they cultural ones or consumer concerns. Accessibility (economic) implies that the financial costs incurred for the acquisition of food for an adequate diet does not threaten or endanger the realization of other basic needs (e.g housing, health, education). Physical accessibility implies that everyone, including physically vulnerable individuals, such as infants and young children, elderly people, the physically disabled, the terminally ill, and persons with persistent medical problems, including the mentally ill, should be ensured access to adequate food. It is generally accepted that the right to food implies three types of state obligations – the obligations to respect, protect and to fulfil. This typology of states obligations was defined in General Comment 12 by the Committee on ESCR and endorsed by states, when the FAO Council adopted the Right to Food Guidelines in November 2004. The obligation to respect requires governments not to take any measures that arbitrarily deprive people of their right to food, for example by measures preventing people from having access to food. The obligation to protect means that states should enforce appropriate laws and take other relevant measures to prevent third parties, including individuals and corporations, from violating the right to food of others. The obligation to fulfil (facilitate and provide) entails that governments must pro-actively engage in activities intended to strengthen people’s access to and utilization of resources so as to facilitate their ability to feed themselves. As a last resort, whenever an individual or group is unable to enjoy the right to adequate food for reasons beyond their control, states have the obligation to fulfil that right directly. States should facilitate sustainable, non-discriminatory and secure access and utilization of resources consistent with their national law and with international law and protect the assets that are important for people’s livelihoods. States should respect and protect the rights of individuals with respect to resources such as land, water, forests, fisheries and livestock without any discrimination. Where necessary and appropriate, States should carry out land reforms and other policy reforms consistent with their human rights obligations and in accordance with the rule of law in order to secure efficient and equitable access to land and to strengthen propoor growth. Special attention may be given to groups such as pastoralists and indigenous people and their relation to natural resources. To sum up, the right to food means that governments must not take actions that result in increasing levels of hunger, food insecurity and malnutrition. It also means that governments must protect people from the actions of powerful others that might violate the right to food. States must also, to the maximum of available resources, invest in the eradication of hunger. Furthermore, under article 2(1), 11(1) and 23 of the ICESCR, states agreed to take steps to the maximum of their available resources to achieve progressively the full realization of the right to adequate food. States also acknowledged the essential role of international cooperation and assistance in this context. Thus, identification of vulnerable, disadvantaged and marginalized groups and action towards removing the factors determining vulnerability are paramount towards the realization of the right to food. During its 8-year mandate, the first UN Special Rapporteur on the right to food focused on several vulnerable groups such as women, children, farmers and peasants, fisherpeople, indigenous people, ‘refugees from hunger’. As member of the Advisory Committee of the UN Human Rights Council, together with his colleagues in this forum, Jean Ziegler again stressed the challenges to the realization of the right to food of peasants and other people living in the rural areas, of children and in particular those affected by or at risk of Noma, rural women and the urban poor. According to figures from the FAO, there are almost 870 million chronically undernourished people in the world today, primarily in developing countries. Every year, 6 million children die, directly or indirectly, from the consequences of undernourishment and malnutrition – that is, 1 child every 5 seconds. States undertook two quantifiable commitments to reduce undernourishment in the world in the last 20 years. In the 1996 Rome Declaration on World Food Security and the Plan of Action of the World Food Summit, they pledged to halve the number of undernourished people by 2015. Four years later, in the United Nations Millennium Declaration, they undertook to halve the proportion of undernourished people by 2015. Before the start of the global food crisis in 2008, experts already recognized that these goals would be difficult to achieve. While the number and proportion of undernourished people decreased since the early 1990s, most of the progress was achieved before the 2007-2008 skyrocketing of food prices. 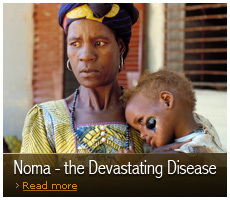 A new food crisis ravaged the Horn of Africa in 2011. Recognizing the failure and continuing challenge, states and the FAO, spurred by civil society organizations, sought to reverse the trend registered since 1996. To this end, they decided to effect a paradigm shift from an anti-hunger approach based on food security to one based on the right to adequate food. This decision was taken at the 2002 WFS, when the 179 participating states reaffirmed the right to adequate food and tasked an FAO intergovernmental working group with developing Right to Food Guidelines in order to provide practical guidance for achieving the goals established in 1996. 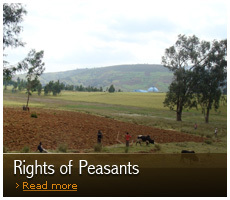 The Right to Food Guidelines were adopted unanimously by the FAO Council in November 2004. Since then, they have been used widely in the fight against hunger – for example in Brazil and many other countries) and in response to the global food crisis. In January 2009, the UN Secretary General stated that the right to food should be added as a third track – with food aid and food security – to respond to the global food crisis and food insecurity. 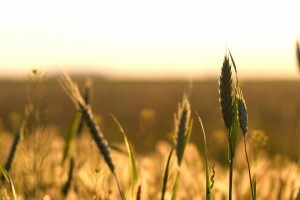 In November 2009, in the Declaration of the World Food Summit on Food Security, states reiterated their commitment to “collectively accelerate steps… to set the world on a path to achieving the progressive realization of the right to adequate food in the contact of national food security”. In parallel to this development and in response to the global food crisis that erupted in 2008, states and international organizations created two new institutional frameworks to coordinate their activities. The United Nations system created the High Level Task Force on Global Food Security (HLTF) in 2008, with the mandate to coordinate the responses of international organizations. The HLTF developed a Comprehensive Framework for Action (CFA) to propose measures to be implemented to respond to the food crisis and propose long term solutions. The CFA was revised in 2010, to adjust to the evolving situation, and became the Updated CFA (UCFA). In November 2009, at the World Food Summit on Food Security, Member States of FAO agreed upon a far-reaching reform of the Committee on World Food Security (CFS), with became a key platform for coordination and exchange of best practices, as well as a forum to promote accountability. Since then, the CFS developed a Global Strategic Framework for Food Security and Nutrition (GSF), a global framework and living document designed to support this process. The two global frameworks adopted in response to the 2008 food crisis recognize the importance of the right to food and aim to provide practical guidance and support for the fight against hunger at all levels. The fight for the right to food continues.